Our sound check happened while the groups of inmates were led into the gym. 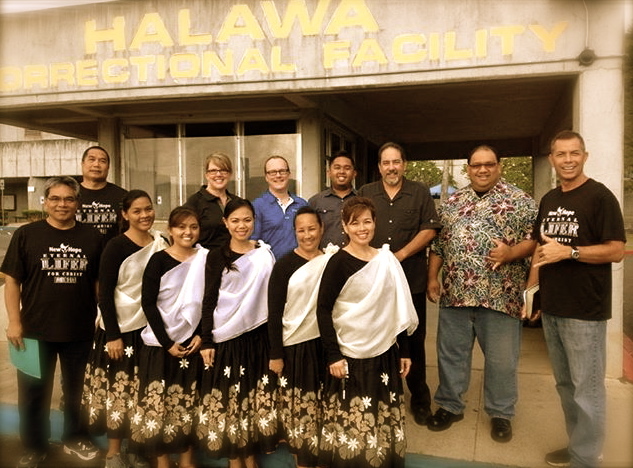 While the sound team, also inmates, were making sure our sound levels were okay, the Halau discussed where they would perform their dance for the services. We knew we may have the entire time allotted for the services or maybe not. Our sound check was the prelude, which is a good thing because then the men were that much more familiar with the songs for the service. They seemed to respond well, and picked up The Glorious Cross pretty quickly. They seemed to know Our God, and especially The Revelation Song. Overall the sets went pretty well. I had trouble hearing Joe’s guitar especially with the reprise of Glorious Cross. Next time I’ll make sure to ask the guys to boost it a bit. We also need to make sure that we have extra music for the play out, and/or at least that we talk it through before we sing it. We tried The Everlasting and did well for the chorus, but I’ve never really sang the melody alone. When Joe switched to the harmony I was a little lost. We made it work. The Halau was fabulous. They dressed very conservatively and Gayle kept the movements discreet. They danced to Mathew West’s “Forgiveness.” One of the really cool things about this is that a few months ago I heard the song on the radio, and I had a picture of Gayle dancing hula to it. WOW! I saw that same picture on Saturday in real life. Thank you Jesus. I’ve missed leading worship; not just the singing part, but also putting together a set list and helping to craft a service. It was such a blessing to hear the response of the inmates to the music and to the message. Pastor Louie is the person for this time. On so many levels he understands what these men have been through. Hopefully I will be able to be a part of something like this again.